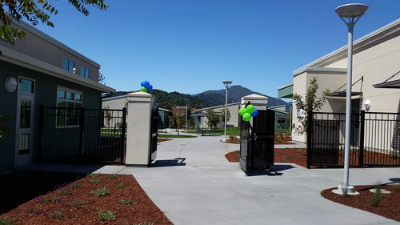 It's been years in the making, but now The Cove School in Corte Madera is finally open for business. And it's beautiful! The new elementary school was built from the ground up on the site where the old San Clemente Elementary School once stood. The old school had most recently been leased out to Lycee Francais during the years that the Larkspur-Corte Madera School District didn't need the space. Now The District has a need for the space once again, because of a steadily increasing school population. Having finally persevered through the tough task of pulling the money together, The District was able to have the new school built, which ended up making more sense than trying to get the old structures up to the current code. The Cove School is a neighborhood elementary school that boasts a modern exterior, with tasteful earthy tones, that helps it assimilate with the immediate surroundings, as well as the majestic backdrop of Mt. Tamalpais and the nearby hills. Classrooms and common areas were carefully planned to take advantage of modern teaching styles, while allowing for flexibility. Adjoining classrooms allow for collaborative work by simply sliding the smartly-designed moveable wall back, turning separate rooms into one large teaching space. There are areas to do projects, complete with sinks and storage, to make them efficient and comfortable. There are breakout rooms for teaching smaller groups privately, while the rest of the class carries on with the lesson at hand. The school auditorium is an open, multi-purpose, facility, modeled after the tech campuses of Silicon Valley. And of Course, The Cove School is staffed with great teachers, administrators, and support; complemented by many involved parents. Find out how I can help you purchase your dream home in the Larkspur-Corte Madera School District. Or contact me to learn about my proven marketing plan to sell your Marin home in the current market conditions. Click here to contact Jonathan B. Jacobs.